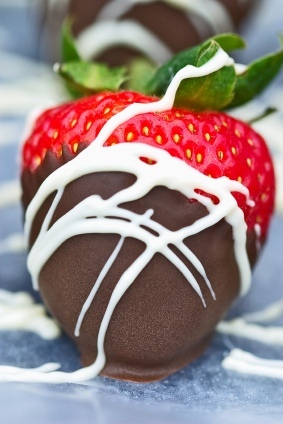 Following are my favorite recipes for chocolate dipped strawberries. The first recipe is the original version; like the picture below. More homemade strawberry dessert recipes at the end of the page. My second chocolate covered strawberry recipe is not only dipped in chocolate, but candy too. Mini M&M's work great here, as well as crushed nuts or even coconut. The little kids and big kids will love it, because they can create their "own candied strawberry." Chocolate covered strawberries can also be healthy, and I am giving you a healthier version to try and not feel a tinge of guilt; actually they are good for you. There are many way to prepare these strawberries, but I am going to give you my easy methods. When you are melting the chocolate over a double boiler, don't let the water touch the bottom of your upper pan. Heat until only 1/2 of the chocolate is melted, then remove from heat and stir gently until it is all melted. The chocolate should actually be cool or tepid to the touch. If it's hot, chances are it will seize up and thicken. If it does that, no amount of heating or stirring will fix it. If you don't have a double-boiler, use a saucepan - bring the water to a boil, and then use a stainless steel bowl to rest in the saucepan to melt the chocolate. Strawberries are grown with many pesticides, so rinse the strawberries first with a veggie wash, and let them drain on paper towels until they were thoroughly dry so the chocolate would adhere properly. Any moisture would have interfered with the chocolate adhering. Spike the strawberries! Fill a syringe with a sweet white dessert wine, and slowly inject the wine into the strawberries from near the stem (after you've done the dipping in chocolate.) You want to inject enough wine to saturate the berries, but watch not to add too much otherwise they end up becoming runny. These are always a hit when I bring them to dinner parties. Pierce the strawberries on the stem side with a toothpick. Holding the strawberry by the toothpick, dip into the chocolate mixture. Turn the strawberries upside down and insert the toothpick into Styrofoam for the chocolate to cool. So, here's the first of my recipes for chocolate dipped strawberries. For a healthier version; make with 12 ounces of (Ghiradelli) dark chocolate chips. This amount covers two pounds of strawberries. Stick toothpicks in the strawberries, and dip them in the chocolate, and then placed them in upside down plastic strainers/colanders with small holes. You can also use Styrofoam to stick them on after dipping. Insert toothpicks into the tops of the strawberries. In a double boiler, melt the chocolate, stirring occasionally until smooth. Holding them by the toothpicks, dip the strawberries into the chocolate mixture. Turn the strawberries upside down and insert the toothpick into Styrofoam for the chocolate to cool. Sprinkle topping of choice on top. My recipes for chocolate dipped strawberries are requested all the time. Enjoy - it's not just for Valentines Day.